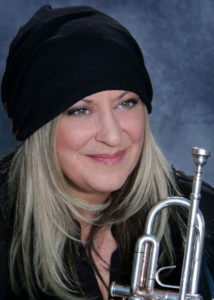 BARBARA LARONGA, Trumpet, hails from Massachusetts and has performed extensively throughout the country and internationally. As a member of “The Diva Jazz Orchestra” she performed with such jazz giants as Dave Brubeck, Clark Terry, Joe Williams, Nancy Wilson, Claudio Roditi, Slide Hampton, The New York Pops, Marian McPartland, and Diane Schuur. She has recorded 5 records with DIVA, 1 with “Fiveplay”, and was part of the acclaimed show “Maurice Hines’ Tappin’ Thru Life”. As a freelancer, she has performed with Aretha Franklin, Mark Wahlberg, Donnie Wahlberg, Dee Dee Bridgewater, and at renowned venues such as Carnegie Hall, Lincoln Center, The Apollo Theater, The Hollywood Bowl, The Newport Jazz Festival, and The Montreal Jazz Festival among others. Her studio work includes “The Tonight Show with Jay Leno”, “What Happens in Vegas”, “7th Heaven”, “Wheel of Fortune”, and “Jeopardy”, as well as various recordings and live broadcasts. As a soloist, Barbara released her debut jazz CD, “Love Never Dies”, a musical memoir of Sept. 11, 2001. As well as having an active performance career, she is also on faculty at 3 colleges in Los Angeles, and has taught for the Midori Foundation, The New York Pops Outreach, and Grammys in the Schools programs. Barbara is also featured on the educational thumb drive for “The Girls in the Band” documentary. She received her MM from Manhattan School of Music, and her BM from UMASS Lowell.